It’s been a while since ‘Collins Bespoken’ has last spoken. And, we can only apologise. This shall not happen again, promise. There have been some exciting changes here within our showroom, office and workshop lately; it’s the perfect excuse to start typing again. I have blog ideas aplenty and I’m so looking forward to sharing them with you. But, to begin, I thought this would be a great chance for our wonderful customers, the current and the ‘yet to be’, to get to know our fabulous team here at Collins Bespoke. It’s also been super helpful for me, Crisi, because I’m new here. Hello! Let’s start with these two, Nick and Gemma. Nick has been designing kitchens and making bespoke cabinetry for over 20 years. Nick’s unique ability to visualise and design very beautiful spaces, complemented by thorough and unrivalled practical knowledge have positioned him as a respected and popular designer. He designs and oversees all of Collins Bespoke’s projects. 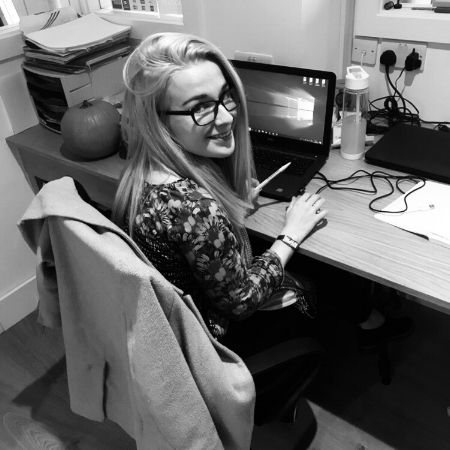 Initially, Gemma worked supporting Nick and the Collins Bespoke team, administratively. However, her role grew along with the company and she now oversees the development of the business, its strategy and its marketing. Tom has been working with Collins Bespoke for nearly four years. 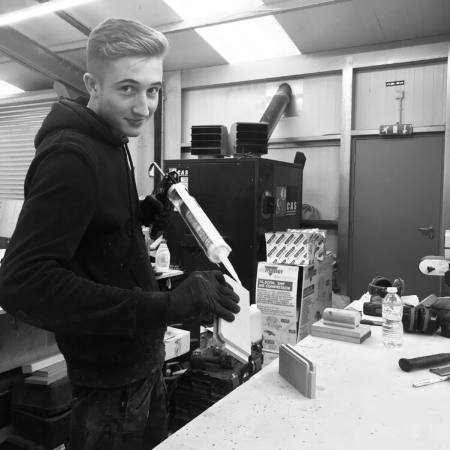 Having started out with a three year apprenticeship in bench joinery, Tom then moved on to furniture and cabinetry. You’ll now find him designing kitchens, whilst still getting involved with the action in the workshop. West Ham is his team! Skiing & Ibiza, every year, is a must. Adrian has been making cabinets since the age of 16. He has been part of the Collins Bespoke team for four years now; he wouldn’t have it any other way. Adrian is a self-confessed workaholic. He loves getting out and about, when he’s not at work. 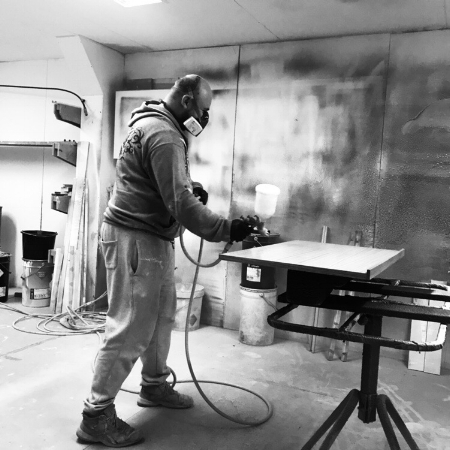 Ryan is our Cabinet Maker/Joiner here at Collins Bespoke and has been with the company for the past two and a half years. He came to us straight from school to complete an apprenticeship and liked it so much – he is still here. Holidays abroad make him smile. He is a car person, cars are his thing! He likes eating out, but, also going to the gym – that’s fair. After studying at the London College of Furniture, Howard went on to have a vast career in bench joinery, cabinet making and shed/out-building manufacturing. He joined the team here 8 months ago! Oh, and clay pigeon shooting too. Howard is also a dab hand at scale modelling. Andrew is currently building his own home, impressive right? His family are the most important thing to him. Visiting new places is good for his soul. Bradley has been a member of the Collins Bespoke team for three and a half years. He loves his job, it’s just that simple. He has been kickboxing for nine years – don’t mess with him. Following football is a big deal. Being out and about with his pals is a good place to be. You’ll often find him sitting by a lake, fishing. Like his brother, Dylan is big into kickboxing. He is the baby of our team, awh! Alex is our Bench Joinery Apprentice and has been working here for about a year and a half. He has always had a keen interest in joinery and is so pleased to be doing something he enjoys every day! The gym is Alex’s happy place. Like me, George is another newbie to team Collins Bespoke. Before starting about a month ago, George studied furniture making at college. He is now enjoying developing his skills and the ongoing learning with us. George is definitely the outdoorsy type. Swimming and mountain biking make a happy George. My journey with Collins Bespoke has literally just begun and I am super excited. I’ve had quite a varied range of previous employment but can honestly say, I now feel like I’ve found my place, finally. Since renovating our first home, I absolutely love anything to do with interior design. I am about to become the proud owner of a Whippet puppy – I am ecstatic. I hope that’s been helpful to those of you wanting to get to know our team a little better. I must say, it truly is a lovely one.